Argosy Cruises offers journeys lasting one hour up to evening cruises with fine dining and dancing. Depending on the size of your party, event or corporate gathering, Argosy Cruises has a dozen vessels to choose from. Reservations recommended for each cruise, but you can sail without them if room is available. All cruise ticket prices include taxes. For ticket information or cruise times, call 206-623-4252 or 800-642-7816. Or, visit The Argosy Anchor at Pier 56 for tickets and gift items. Seattle skyline with the Space Needle and Seattle Center. 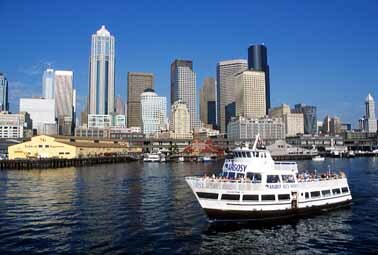 Harbor Cruise Seattle departs from Pier 55 several times a day, all year round. From January 1 to March 30 and November 1 to December 31, one-hour cruises are only offered on Saturday and Sunday. Lake Cruise Kirkland is a one and a half long cruise around Lake Washington with sights that include Mount Rainier, Husky Stadium and the terrific scenery of the Pacific Northwest. circle the lake. This trip lasts for two hours. Locks Cruise Seattle is a two and a half hour trip to see the locks that keep the waterborne traffic of Seattle on the move. 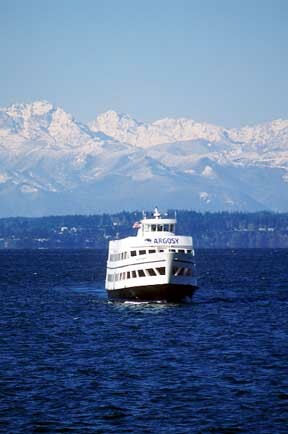 You'll travel on the saltwater of Puget Sound and the freshwater of Lake Washington on your way to Hiram Chittendon Locks. Lake Cruise Seattle departs from Pier 56 on Seattle's Waterfront. Saturday and Sunday. Dinner cruises sail from 7 to 9:30 p.m. and range from $52 for children during the week to $83 for adults on weekend days. Each cruise includes ticket, appetizer, entr?e, dessert, coffee and teas, tax and service. Bar service not included in ticket price. Royal Argosy sails from Pier 56. Reservations are taken on a space-available basis. Argosy Cruises' 12-ship fleet is available for charter for groups from eight diners to large events with 800 people. The Royal Argosy offers a variety of event plans for weddings, parties or corporate events. 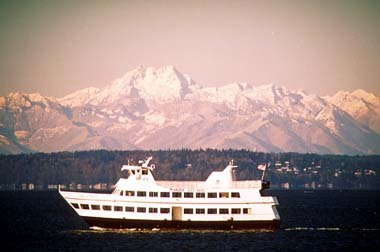 The Spirit of Seattle can take up to 400 people sailing around Puget Sound, the Goodtime can handle up to 300 while the historic M.V. Kirkland sails with 150 guests. Prices and sailing times vary from ship to ship, due to season, time of day and day of the week. 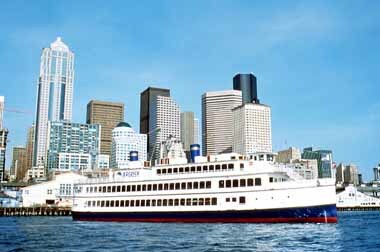 For special event planning with Argosy Cruises, call 206-623- 1445 or 800-642-7816.